35 Albury Street the premises of The Irish National League & Club 1911. 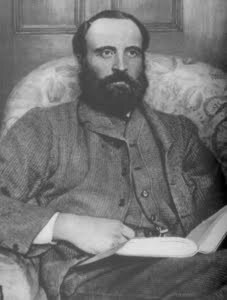 The Irish National League was established by Charles Stewart Parnell (pictured) in 1882 and became a major movement for Irish home rule, with branches not only across Ireland but in England - including in South London. In Deptford, support for Irish Home Rule pre-dated the formation of the League. On 2 October 1876 a public meeting in Deptford was attached by anti-Home Rulers, recalled in the T.D. Sullivan : 'They invaded a hall where a Home Rule meeting was being-held; they "stormed" the platform, and made a determined endeavour to capture the Home Rule banner which was there displayed. But the flag was bravely defended, and after some fierce fighting, the attacking party were ejected from the building'. In the 1880s, the Irish National League rallied at Sayes Court in Deptford and the Post Office Directory lists a United Irish National League and Club at 35 Albury Street, Deptford in 1911. The Irish National League (INL) was a nationalist political party in Ireland. It was founded in October 1882 by Charles Stewart Parnell as the successor to the Irish National Land League after this was suppressed. Whereas the Land League had agitated for land reform, the National League also campaigned for self-government or Irish Home Rule, further enfranchisement and economic reforms. The League was the main base of support for the Irish Parliamentary Party (IPP), and under Parnell's leadership, it grew quickly to over 1,000 branches throughout the island. In 1884, the League secured the support of the Roman Catholic Church in Ireland. Its secretary was Timothy Harrington who organised the Plan of Campaign in 1886. In December 1890 both the INL and the IPP split on the issues of Parnell's long standing family relationship with Katharine O'Shea , the earlier separated wife of a fellow MP, Capt. O'Shea, and their subsequent divorce proceedings. The majority of the League, which opposed Parnell, broke away to form the "Anti-Parnellite" Irish National Federation (INF) under John Dillon. John Redmond assumed the leadership of the minority "Parnellite" group who remained faithful to Parnell. Despite the split, in the 1892 general election the combined factions still retained the Irish nationalist vote and their 81 seats. Early in 1900 the Irish National League (INL) finally merged with the United Irish League and the National Federation (INF) to form a reunited Irish Parliamentary Party under Redmond's leadership returning 77 seats in the September 1900 general election, together with 5 Independent Nationalists, or Healyites.